Follow the UNSP Working Group! 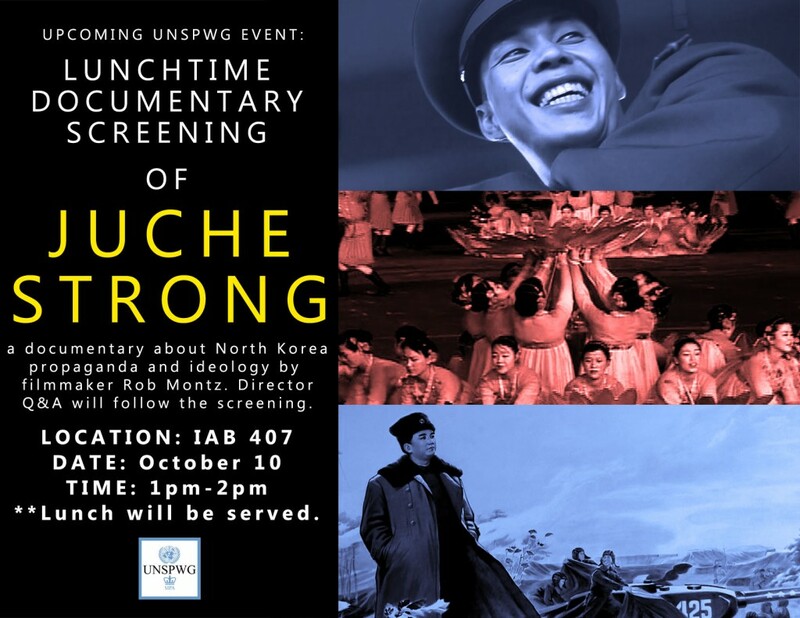 On October 10 from 1-2pm in Room 407, join members of the UNSPWG for a screening of “Juche Strong,” a documentary about propaganda and ideology in North Korea. Stick around after to meet and greet the filmmaker, Rob Montz. This film explodes misconceptions of North Korea and argues that the propaganda-fueled national ideology has played an integral role in keeping the country together. The Kim regime has crafted a very specific national ideology designed to tap into the unique cultural and religious heritage of the Korean people. Juche Strong delves into the specifics of that ideology and shows how it instills a collective sense of purpose. 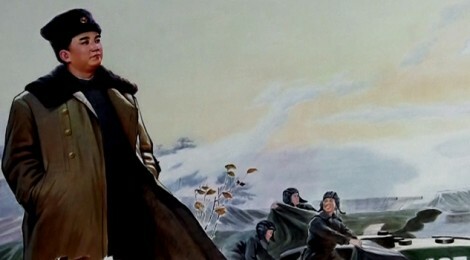 “Juche” is North Korea’s founding philosophical precept. Roughly, it translates to “self-reliance” — the idea that North Koreans are free from polluting foreign influences and capable of building a prosperous nation on their own. The film is grounded in interviews with over a dozen prominent North Korean scholars, including Bruce Cummings, David Kang, Victor Cha, Stephan Haggard, and Suk-Young Kim. When Kim Il-Sung takes over in the 50s, he’s staring at people who have just relieved themselves of 40 years of incredibly brutal Japanese control. Then they go through the Korean War. This is a people primed to the idea that foreigners are not to be trusted,and that we need to figure out a way to operate completely independent of foreign influence. A lot of what gets presented to Americans as North Korean propaganda actually isn’t — most people never double check to see if it’s authentic. As long as the video fits with the prevailing Western narrative that the country is hopelessly bizarre and oppressive, the average American will assume it’s the real deal and will tweet it/facebook status it/leave a typo-heavy blog comment about it. Most recently, there was a video said to be DPRK propaganda that depicts Americans “eating snow.” That video went viral and plenty of people used it a proof positive that the caricature of the country is correct. Turns out that video is a fraud and was easily debunked. We hope to see you on October 10!